Prototype: German Federal Railroad (DB) Rheingold offshoot train TEE 16 passenger cars from Salzburg to Emmerich. 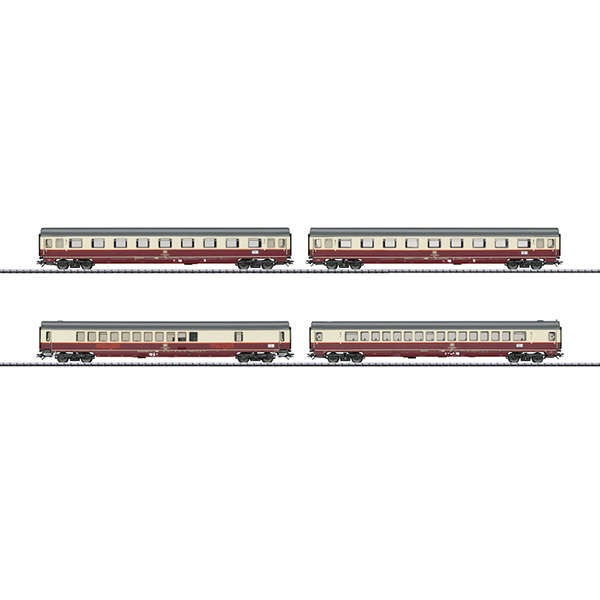 Two type Avmz 111.1 compartment cars, one type Apmz 122 open seating car, and one type WGmh 854 entertainment car. Crimson/ivory paint scheme. The cars look as they did in 1986. Model: The entertainment car has an mfx digital decoder and extensive sound functions. The trucks are a Minden-Deutz heavy design with disk brakes and magnetic brakes but without roll stabilizers. The car has factory-installed interior lighting that can be controlled separately in digital operation. Maintenance-free LEDs are used for the lighting. The car has operating current-conducting couplers. All of the cars have factory-installed LED interior lighting and operating current-conducting couplers. The open seating car has built-in marker lights. Total length over the buffers approximately 114 cm / 44-7/8".